What’s the point in experiencing life’s greatest pleasures if you can’t share them with your friends? And what better friend to share kayaking adventures with than your dog! Spending time with your furry friend needn’t be limited to walks around the park. You can take your dog with you in your kayak where you can both enjoy a relaxing time on the water. And that’s why we’ve made it our mission to help you find the best kayak for dogs. There are plenty of options on the market that are suitable for dogs. So much so that it can be difficult to know which models are best. So here are a few key factors you should consider before purchasing a kayak for you and your dog. It goes without saying that the size of your dog should impact your decision when picking your kayak. Before considering your kayak’s dimensions, you will need to know your dog’s dimensions. Even the most docile and well behaved dogs will move around so you need to make sure that your kayak is adequately sized to make it a comfortable and safe experience. The width of the kayak is important to consider. You need to be assured that whichever way your dog is standing, both front and back feet fit comfortably on the kayak. You don’t want your dog slipping and falling out. Many find that sit on top kayaks are more suitable for dogs as they are open, allowing your dog to roam about freely. Your dog can jump into the water with ease and can easily get back on to the kayak with some assistance from you. Sit-On-Top Kayaks are also generally considered more stable so this is an added advantage. However, small or timid dogs might prefer the sit-in, where they can get cosy in the cavity by your feet or even sit on your lap whilst you paddle. This of course depends entirely on your dog’s personality, breed and size. Single kayaks (whether sit-in or sit-on-top) have one seat and generally only enough room for you, your equipment and some food supplies. If you have a large dog, you may find that this is not sufficient and a tandem would therefore be a better option. Fishing kayaks are generally considered more stable as they are built to allow you to sit or stand on them. They are therefore very good kayaks for dogs. They may not perform well in rapids as they are not designed to do so but if you’re kayaking with your dog you should be sticking to primarily calm and flat waters anyway. Don’t be afraid to explore the option of an inflatable kayak for you and your dog. Advancements in technology have made inflatable kayaks just as durable (if not more so) than hardshell kayaks. The outer layer is made of rubber and PVC (similar to white water rafts or life boats) so as long as your dog’s nails are trimmed, you shouldn’t have any problems or punctures. Inflatable kayaks also have a higher weight capacity than hardshell kayaks and are generally considered more stable. So if you have a Bernese Mountain Dog or a Great Dane, an inflatable kayak may well be the best option for you. Have your dog wear a PFD (personal flotation device) at ​all times. Remember sun cream as some areas (noses in particular) are prone to burning. Never tie your dog to the boat. Take plenty of water and enough food. Most importantly, you need to prepare your dog for kayaking beforehand. Practice getting in and out of a kayak and staying still on dry land (use your leash only on dry land) so that you are in control on the water. If your dog is disobedient - they’re not ready for kayaking. Once you’ve got them trained, you can enjoy a wonderful and stress-free time with them on the water. The hull is designed for the ultimate stability and tracking so that you can stand up to fish or sit side-saddle without tipping <<< tracking is useful only when paddling. This high level of stability along with the large weight capacity is great news if you’re kayaking with a large dog. Designed for both comfort and high function, this kayak comes with several footrest positions which cater for kayakers of all shapes and sizes. This can also come in handy if your dog decides to reset between your legs or near your feet. If you’re keen on fishing, this kayak comes complete with several built-in features that may be of interest. Made with comfort and stability in mind, this is a great option for kayaking or fishing with you dog. This is an inflatable, two-person kayak that can hold up to three people (two adults and a child or dog). However, for maximum comfort and space, it is best used for two people (or one person and a large dog). Made from K-80 Polykrylar, it is highly durable, tear resistant and can hold up to a whopping 650 pounds. Ideal for anyone with a very large dog. Designed for ultra stability, the floor of the kayak is made from 5 I-beam tubes. This makes for easier paddling as the rider sits high and the weight is born by the floor instead of the side chambers. This stability once again is great for kayaking with dogs. The 5-tube design also creates a more rigid floor which improves the speed and tracking of the kayak. Furthermore, the two molded skegs (like you see on surf boards) at the bottom of the kayak allow for even better tracking and speed, enabling you to go faster and further with less paddling effort. 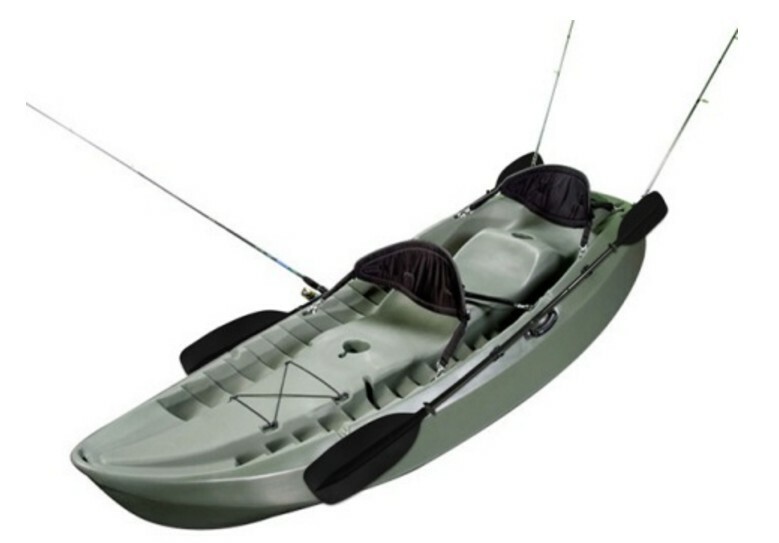 This kayak is specifically designed for fishing. As mentioned above, fishing kayaks are particularly good for dogs as they are made for ultimate stability. Made for one paddler, the Perception Pescador Pro 12 comes with a removable seat for your ultimate comfort on the water. This seat comes with two positions (upright and recline) and can be adjusted on the go with a molded-in accessory track recess. Storage is also available in abundance including a tank-well with bungee, molded-in rod holders, a mold-in cup holder, recessed tackle box storage and a center console where you can rig fish finder electronics. Depending on the size of your dog, you may need to forego some extra equipment in order to have them accompany you in this kayak but overall it will provide you with a smooth and comfortable day out on the water. This is an inflatable fishing kayak designed for two people (or one person and one large dog). Made of 1000 denier tarpaulin at the bottom and 840 denier nylon on the cover, this kayak is robust, durable and puncture resistant. Made for comfort as well as stability, this kayak comes with two adjustable seats. This is great not only for your comfort but also for the comfort of your dog as you can move the seat closer to you if required. It comes with plenty of storage options along with rod holders and paddle holders for when you fancy a rest or just want to sit and float for a while. As for getting it to and from the water, there is an in-built, double threaded Boston valve and a pressure gauge for easy and accurate inflation and deflation and comfortable carry handles for a smooth transition into the water. This kayak is designed to be used as both a kayak and paddle board. The deck is made with no-slip padding and the kayak is designed particularly for stability and smooth tracking. This is therefore a great option for dogs of various sizes. Complete with a fold-down seat and a cooler storage area, a rear tank-well for additional storage and a built-in cup holder, this kayak is ideal for relaxing days on the water with your dog and a couple of cool beers. There’s even a swim deck at the back of the kayak which is ideal for dogs (or kids). This is not only a perfect place for your dog to sit and relax, but also makes entering and re-entering the water a lot easier. Size - make sure your kayak is big enough for your dog to move and sit comfortably. Weight capacity - your kayak needs to be able to hold you, your dog and your equipment. Safety - have your dog in a PFD at all times, remember sun cream & water, never tie your dog to the boat, stick to calm waters and prepare your dog for kayaking - don’t just throw them in at the deep end (literally). Once you’ve considered these basics, you are guaranteed to have a wonderful time on the water with man’s best friend. We hope out guide to suitable dog kayaks was useful. If you've any questions on the subject, we'll do our best to answer them. Just don't ask us why your dog is hungry ALL the time, hehe.